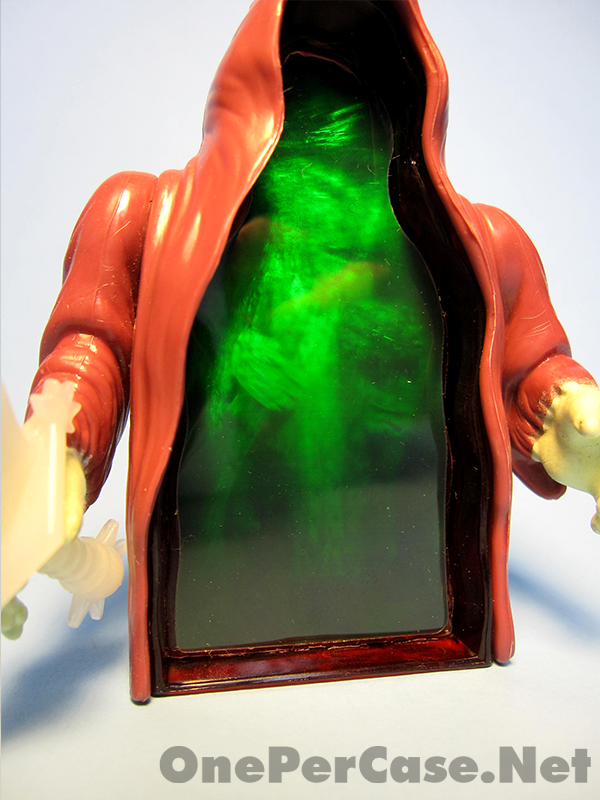 As long as there have been toys, there have been gimmicks to try to help sell those toys. In the 80s, kids couldn’t resist flashy things like holographic stickers. 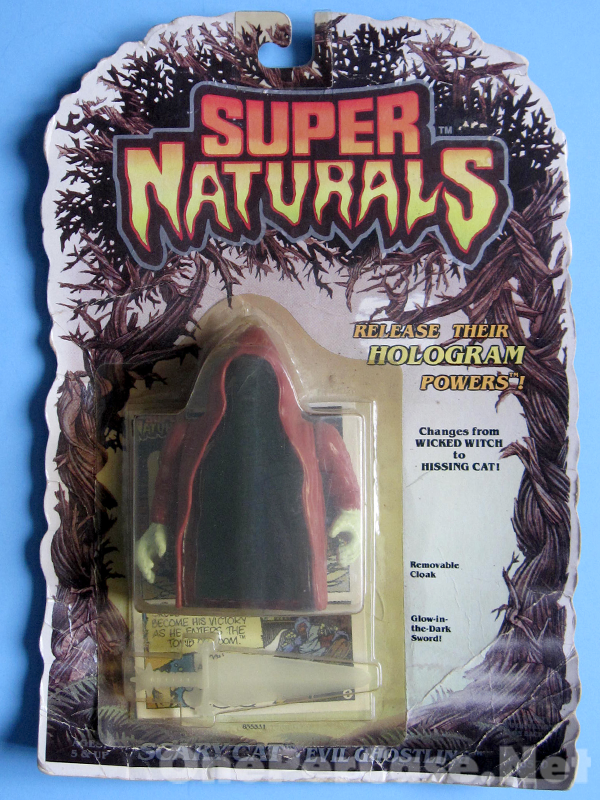 Perhaps in an effort to prove that they could deliver more than big yellow trucks, Tonka decided to take some of those holographic stickers and slap them on simple toys, and bam, the Super Naturals toy line is born! 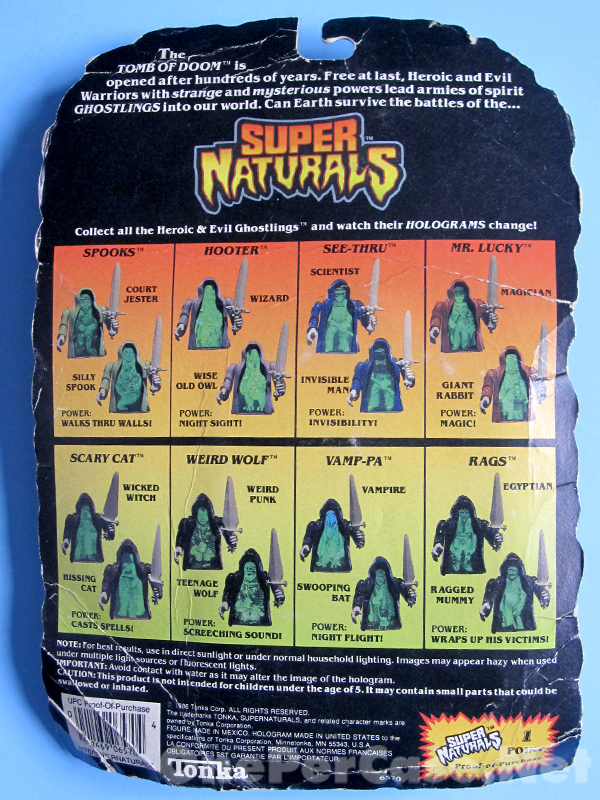 Unlike the vast majority of toy lines, particularly in the 80s, there was no cartoon to support Super Naturals. Basically, there were two factions of ghost-warriors, one good and one bad. Perhaps due to the lack of a cartoon, or perhaps due to the toys themselves, this line never picked up a whole lot of traction. Scary Cat is basically your run-of-the-mill Super Natural. Starting off with the packaging, this isn’t a bad looking toy. 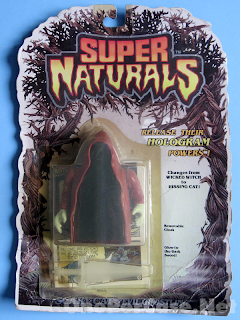 There’s a nice creepy looking tree/vine type thing framing the front, and Super Naturals written in a spooky font. 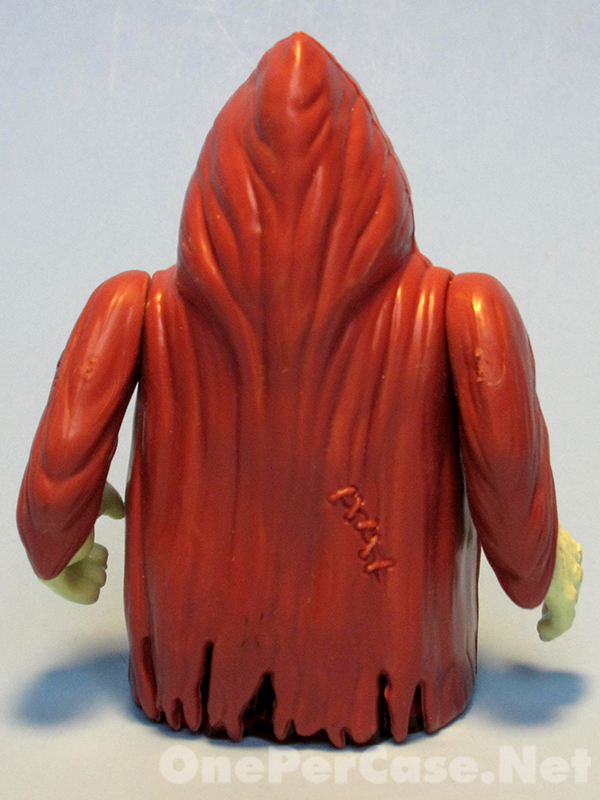 The back of the card is standard action figure fare - a quick explanation of what the toys are all about and a display of the other ghostlings that your local retailer would be happy to sell to you. 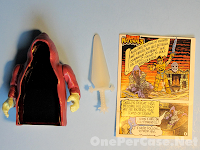 Scary Cat comes packed with a cloak, a glow-in-the-dark sword and what I guess could be described as a “mini-comic”. Very mini. 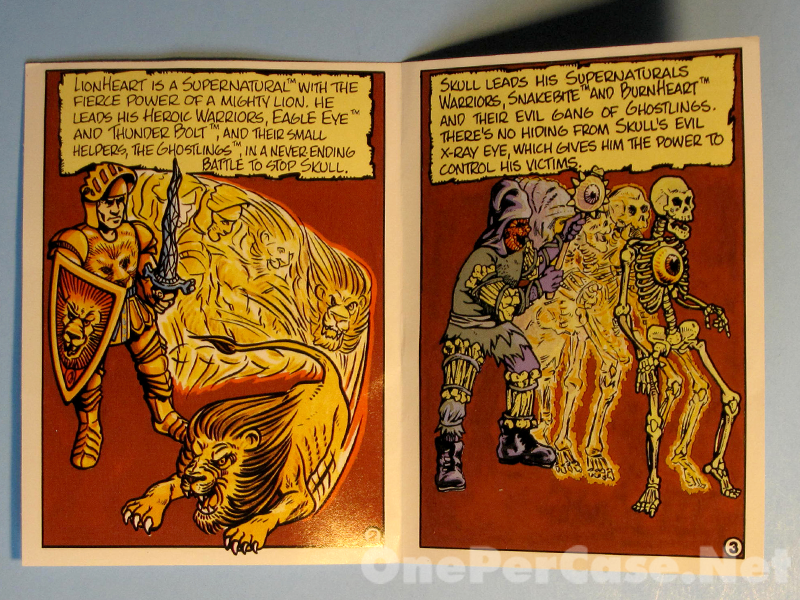 Front and back folded, four page mini. 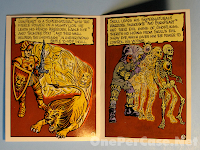 Since there’s no cartoon to help explain the line, the mini-comic helps provide a small amount of background. I guess beyond that, kids are left to use their imagination. The figure itself is a fairly simple, basic design. 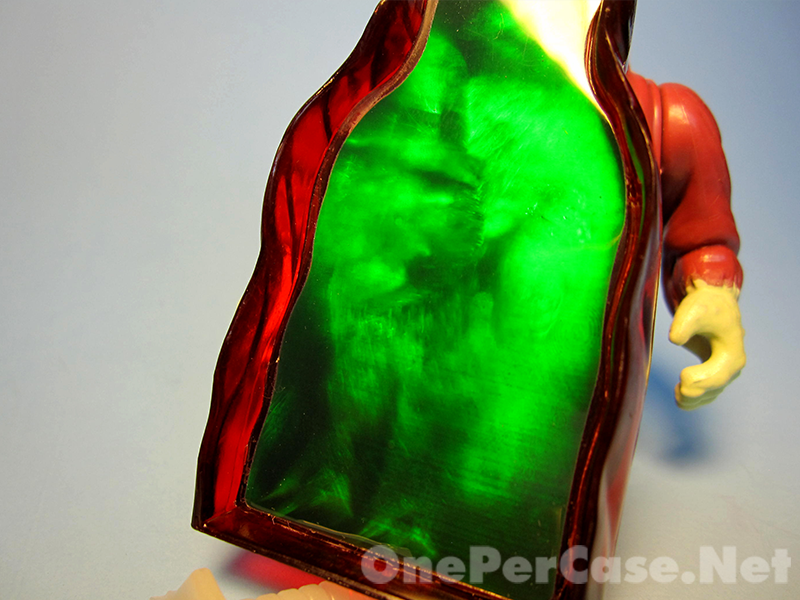 Give-or-take, you have a tombstone shaped torso with a holographic sticker slapped on it. Over that, you have a removable molded plastic cloak that has the arms (with rotating shoulders) attached. 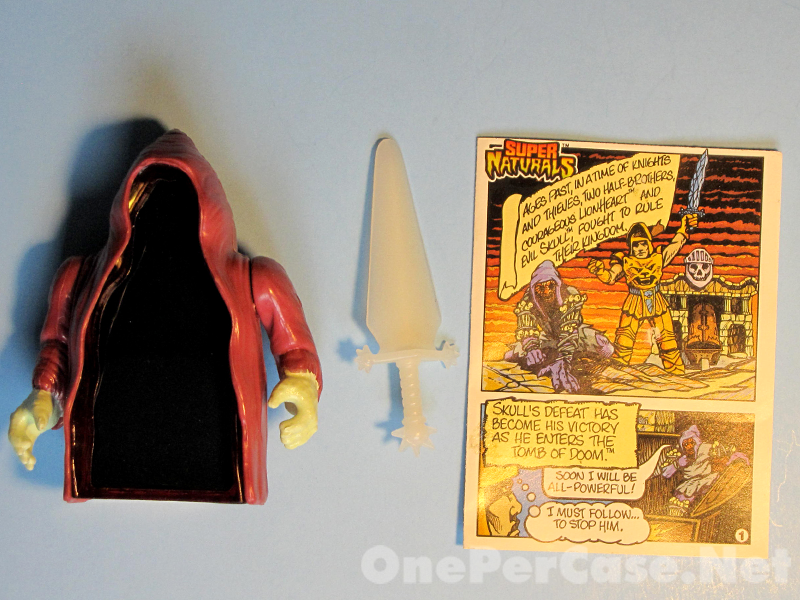 That describes all the “ghostling” figures from Super Naturals. Yes, if you remove the cloak, you take the arms with it. 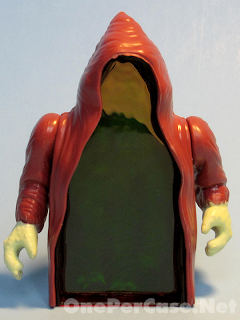 A little odd, but I can get over it as it makes the cloak look like a ghost once removed. In the case of Scary Cat, the hologram will show you either a witch or a cat, depending on your viewing angle. 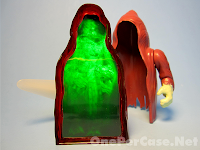 In the case of my figure, the witch tends to show easier than the cat, as you can probably tell from the pictures. 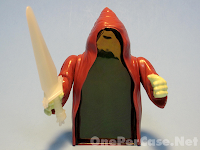 The other fun feature here would be the glow-in-the-dark sword and hands. 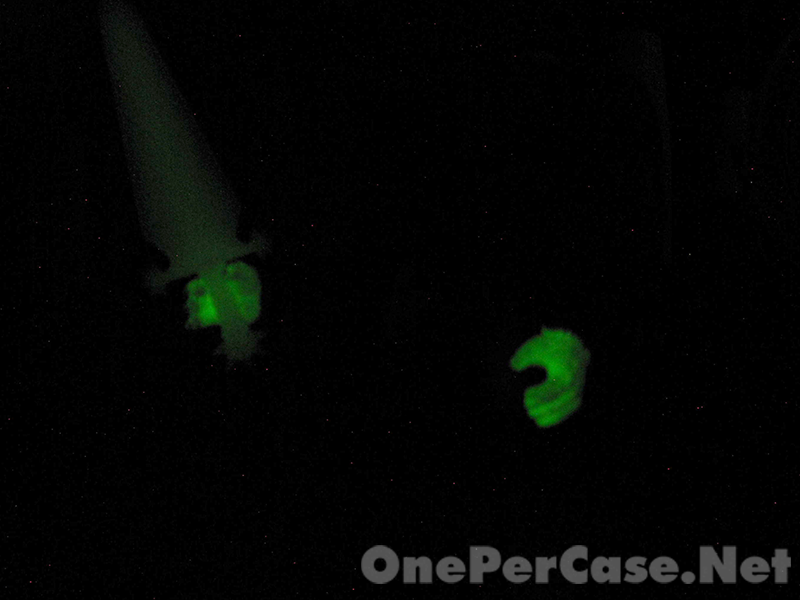 Stick this guy under a lamp for 20 seconds, and he’ll shine bright… briefly anyways. 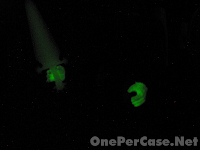 I was always a sucker for all things glow-in-the-dark (toy pack-ins, cereal boxprizes, etc.) so this feature is fully Brett X approved. So that’s Scary Cat for you. 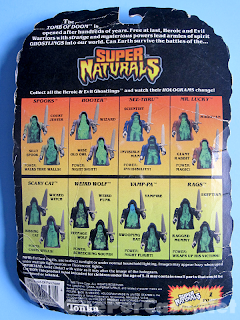 Honestly, if you were never into these in the 80s, then you’re probably going to find it difficult to get too excited about Super Naturals now. The plus side? If you ARE interested, you can typically pick these up on the cheap, especially compared to the more popular toys from the 80s.